I tend to soak and cook a pot of beans over the weekend to put together a quick, delicious meal at some point during the week. These navy beans were the ones I sneakily purchased in my own sturdy green produce bag from WinCo. I puréed the remaining tomatillos from my co-worker and a couple poblanos I picked up from the weekend farmer’s market. I also threw in some of my own straggling hot peppers that didn’t have a home yet and a few cloves of garlic. Some oil and a chopped onion started the sauté, followed by the vegetables and some cumin. Those cooked a bit, then I added the beans, along with some more water and the homemade bouillon I made recently. This all simmered together until it became more creamy and the flavors developed and melded together. When I make time in the morning, I make coffee and take it to work in my vintage floral thermos. 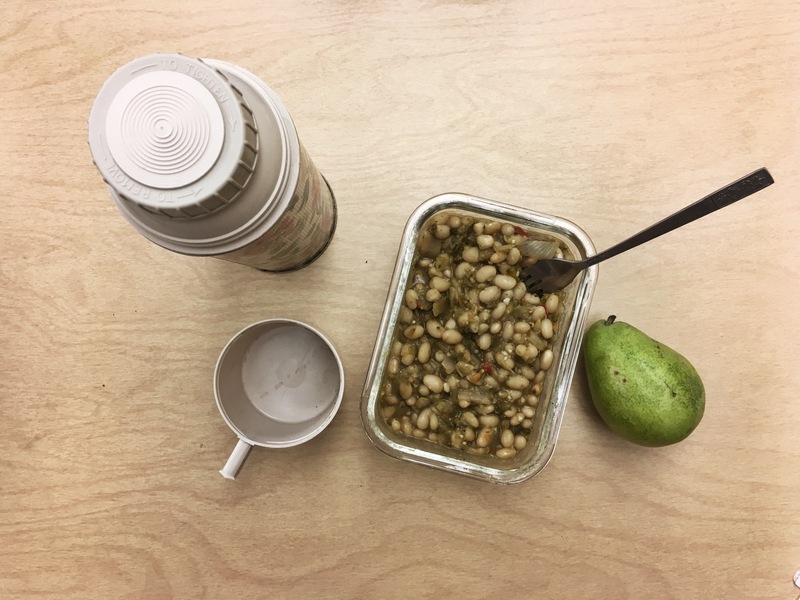 Lunch was packed in a Pro Glass container along with a local pear into my lifewithoutplastic lunch bag. My classroom and my lunch bag that I use every day. Easy and delicious! I definitely notice a difference in my quality of life and quality of food with a tad more forethought and preparation during my time at home. I stock a cupboard in my room with bowls and silverware so that I never have to use plastic, and neither do my students when I give them a snack. I just wash the dishes with a sponge and a glass bottle of dish soap and let dry on a towel. I also have a bottle of diluted vinegar and cleaning cloths + towels for cleaning and drying hands.